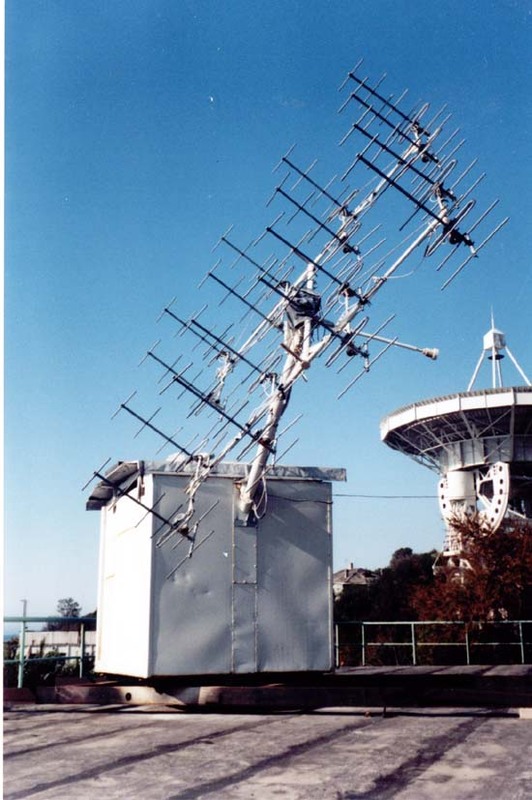 Antenna used for e-CALLISTO is a synphased array of 16 elements (4x4) with total size of 3.5x3.5 meter. Every Yagi consists of 7 dipoles. The frequency range is 250-350 MHz, the beam pattern is of the order of 11o. Aerial is set on a parallactic mount with an electric drive for tracking the sun from 5 UT up to 13 UT. The antenna is connected with a CALLISTO spectrometer (placed in a laboratory room) through out a preamplifier ZX60-33LN+ having a gain of 20 dB (placed in antenna box) and through 40 meters of coaxial cable (total losses 4 dB). The sensitivity of the equipment is good enough for the observation of quite sun level. A construction of new antenna with bigger frequency range is planned in future. Photo: courtesy: Aleksandr Volvach, Radio Astronomy of Crimean Astrophysical Observatory, Ukraine. Installation of a large log-per at Space Weather Monitoring Center at Helwan University south of Cairo, Egypt. The antenna covers 20 MHz up to about 175 MHz. A MiniCircuits preamplifier is just below the antenna enclosed in a metal box.